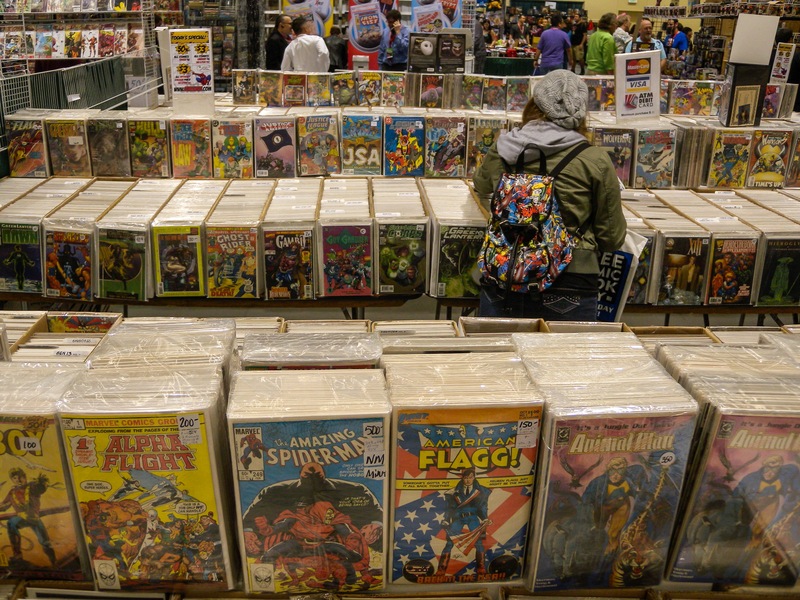 I love a good comic convention, and any geek-out gathering of a similar nature. For me, it’s all about my comic/graphic novel appreciations, and all the connecting fantasy and science fiction driven art. To be among the creatives, and to converse with them is a complex joy that never ends for me. 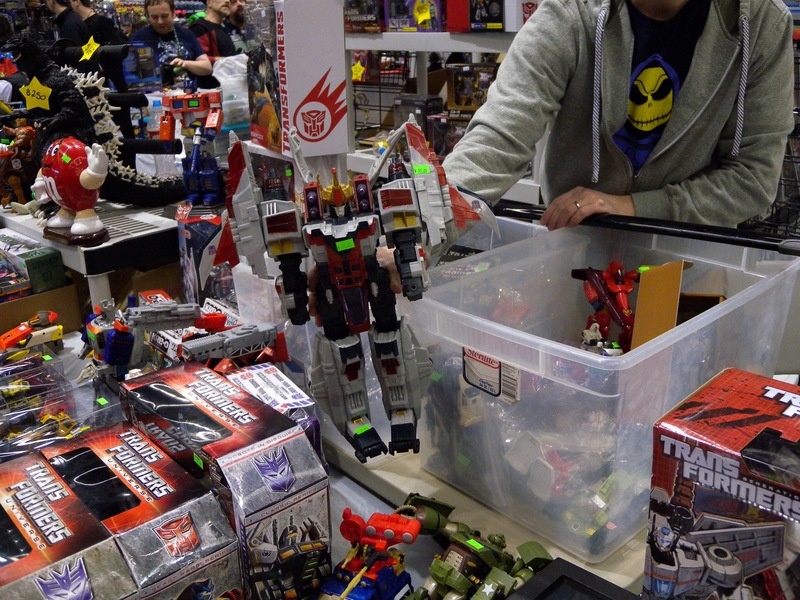 I also enjoy the thrill of a good hunt, to peek through the exhibit floors.Through the aisles I explore the artist alleys, company booths, dealer tables, and demo stops. I take much with me. All including (but not limited to) my personal favorite things to take home are: sketches, cheap loose figures, vintage magazines, bargain comics (including graphic novels, trade paperbacks), special edition exclusives, free swag, samples, and the occasional new thing an exhibitor successfully pitched . I also take home some interesting memories, and fun sights. I love taking pictures of people and happenings, to treasure the shows further. Every convention over the last 20 years (lost count of how many of these now), has had something special. I often meet someone new, or see some interesting gathering. I meet an admired creator, or listen to the words of some interesting celebrity to the realms of geek. This is all great fun. 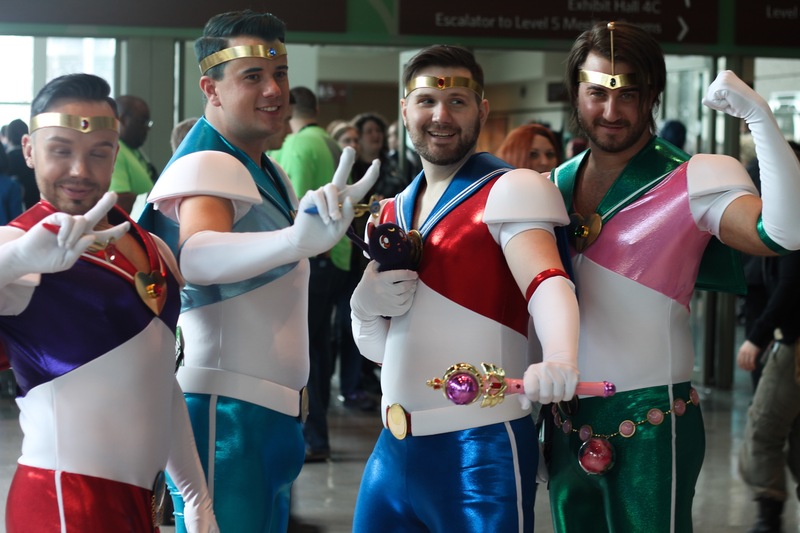 Here are some wonderful memories of this Emerald City Comic Con (my third attended) for 2015. 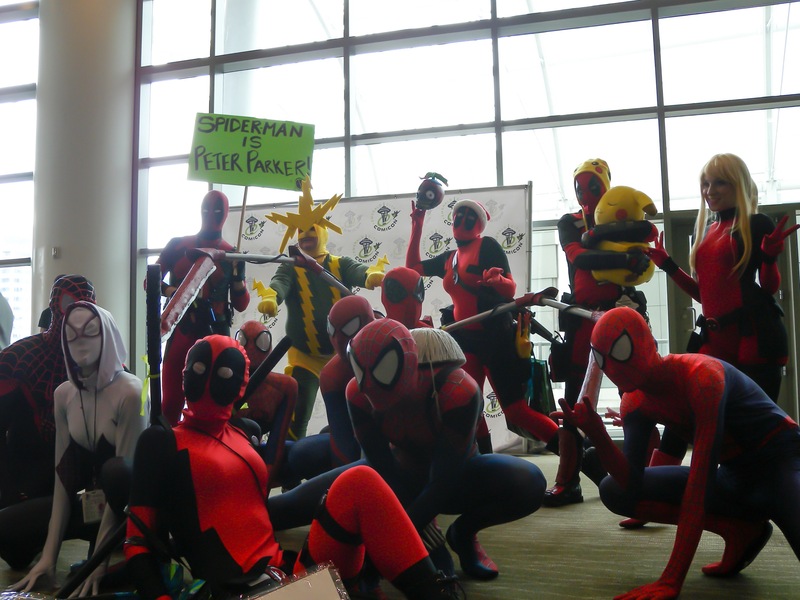 The gathering of Spider-Man and related Marvel Comics cosplayers. Among them were many Deadpools, and some Spider-Gwens (a new character to the Marvel Universe, long story), and a classic Electro (a personal fav to my childhood cartoon viewing). 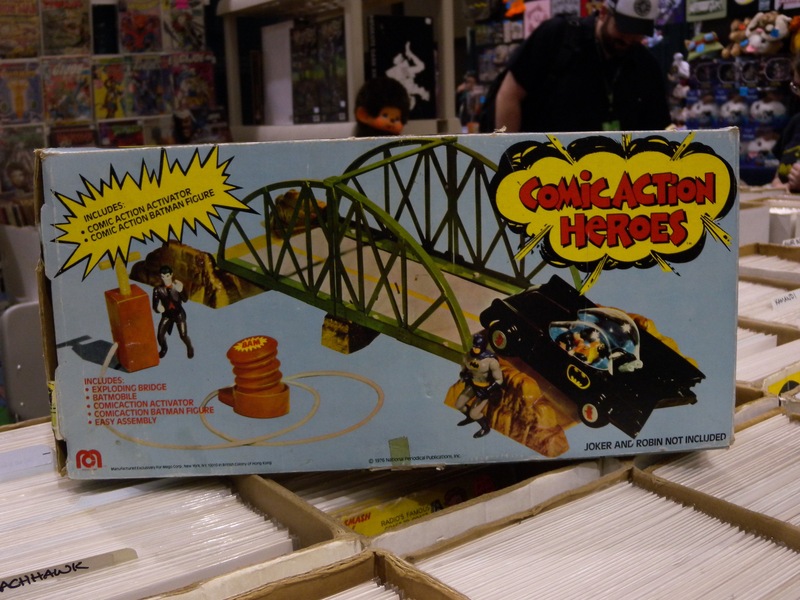 I noticed an abundance of loose action figure toys. Much of which I feel somewhat amused, that an appreciation of plastic detailing and articulated mobility could still be a fun novelty, in my grown-up years. 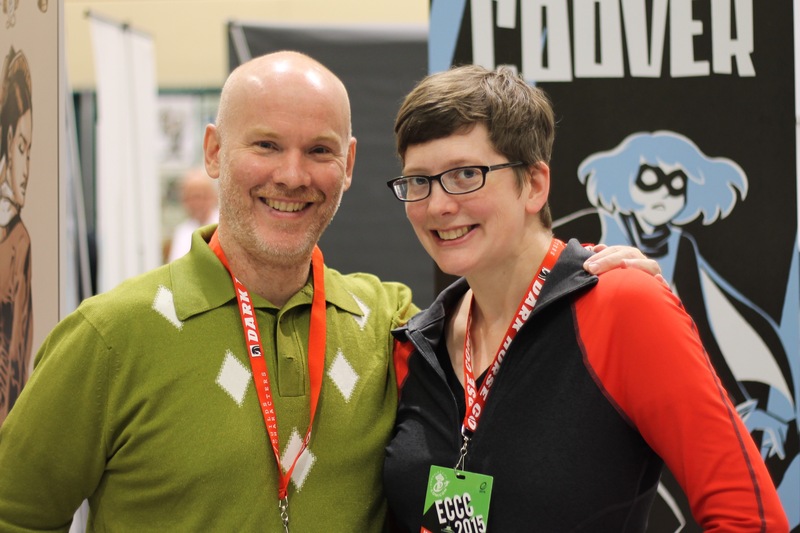 Paul Tobin (writer) and Colleen Cloover (artist), of the Bandette comics; a personal favorite (and highly recommended) series of a whimsical super-hero thief. Both a married couple hosting their own booth, and a joy to meet. 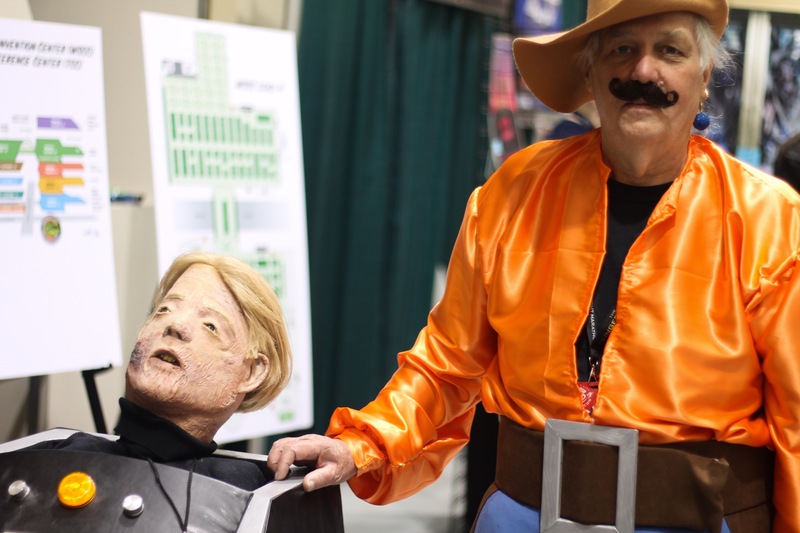 Christopher Pike, and Harry Mudd cosplay; from the Classic Star Trek series. I love seeing comic book covers of different areas on display and in boxes. There is an awesome nostalgic beauty to all this. 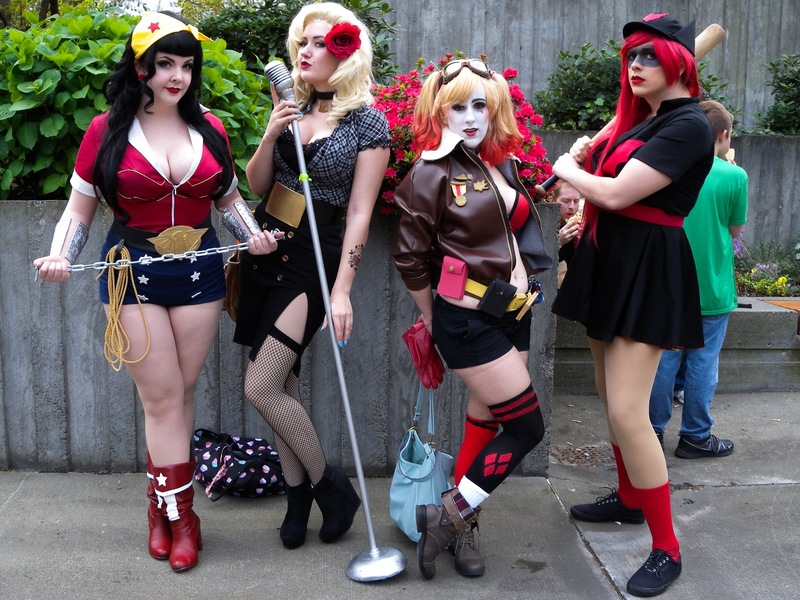 DC Comics “Bombshell” versions of Wonder Woman, Black Canary, Harley Quinn, and Batwoman. All brought to life, from a series of variant comic covers showing the heroines with vintage pulp cover twists. Well done. 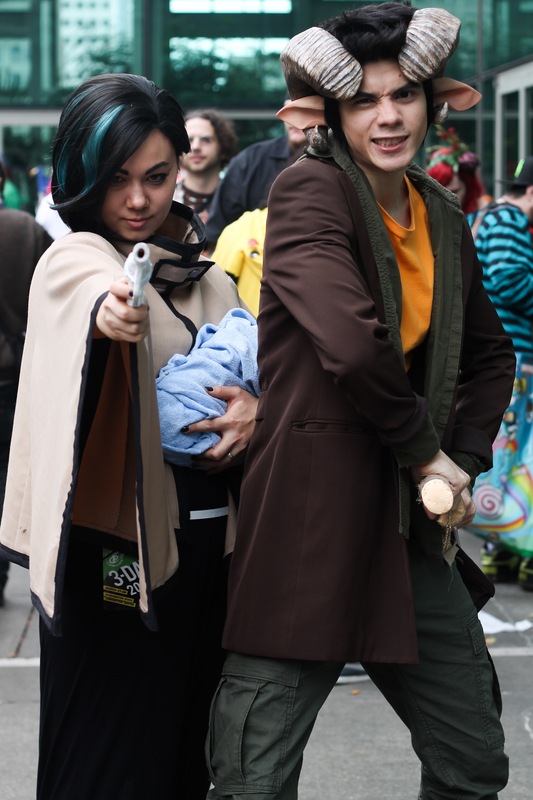 Alana and Marko cosplayers, from the Saga comics series. Saga (by Fiona Staple and Brian K. Vaughan) is the best sci-fantasy comic series currently released on the shelves now. A vintage Batman playset still in the box. Will Batman save Robin in time, or will the Joker have the last laugh? 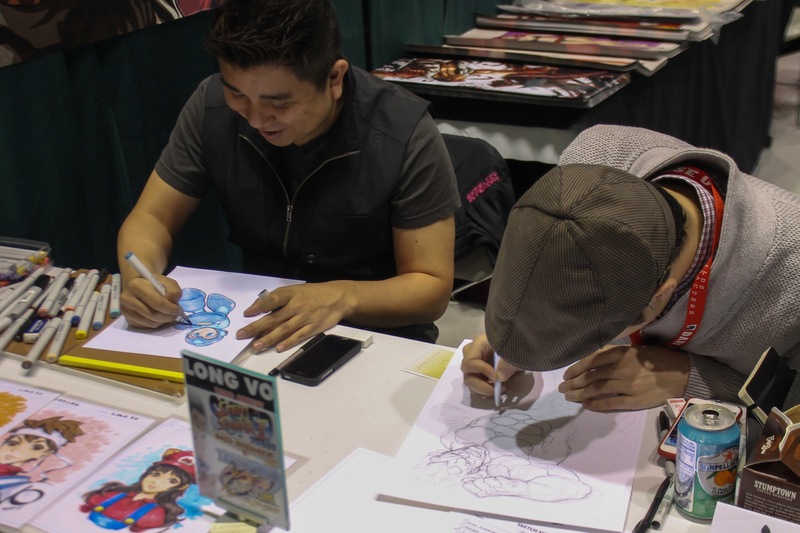 Jim Mahfood, an admired artist over my last two decades of comic reading. 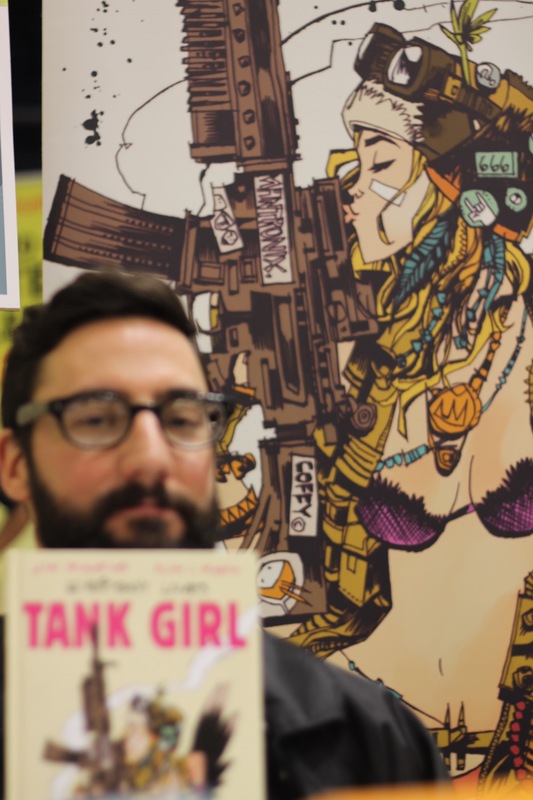 He is the perfect match for the new Tank Girl series coming out. He also drew me a cool Batman sketch. 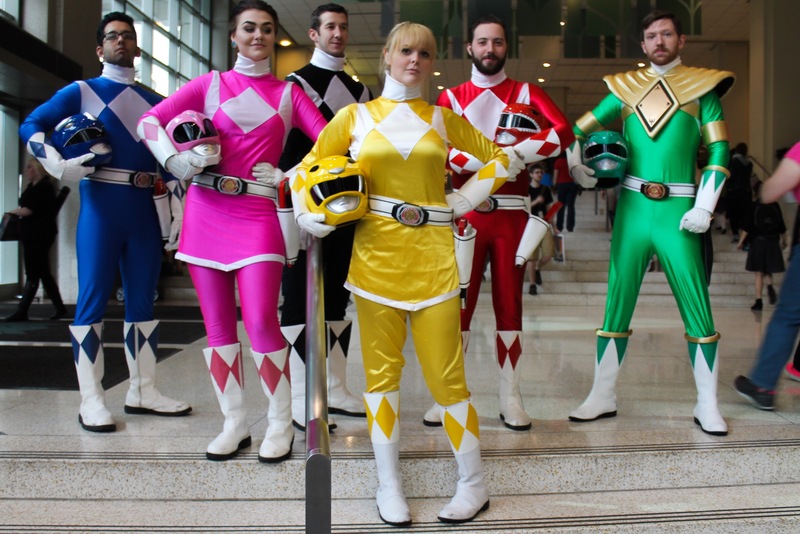 And here, are the Mighty Morphin Power Rangers. Seattle is safe for now! 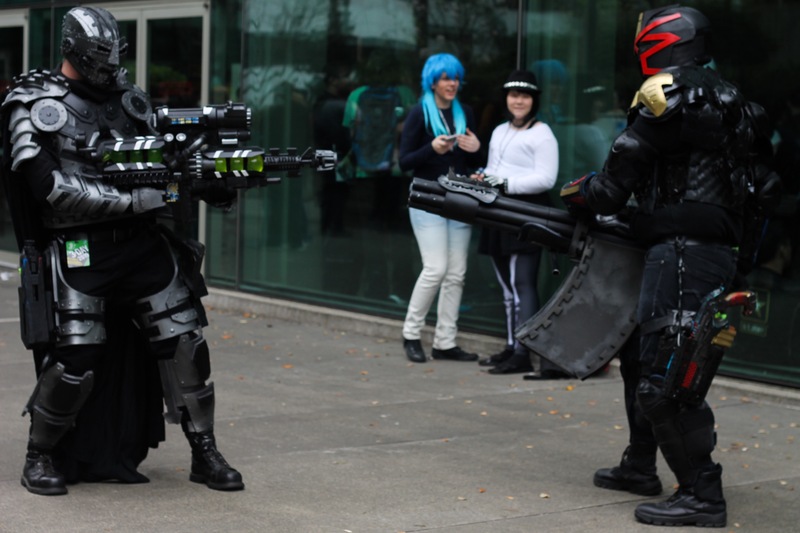 Doctor Doom vs. Judge Dredd. Place your bets! 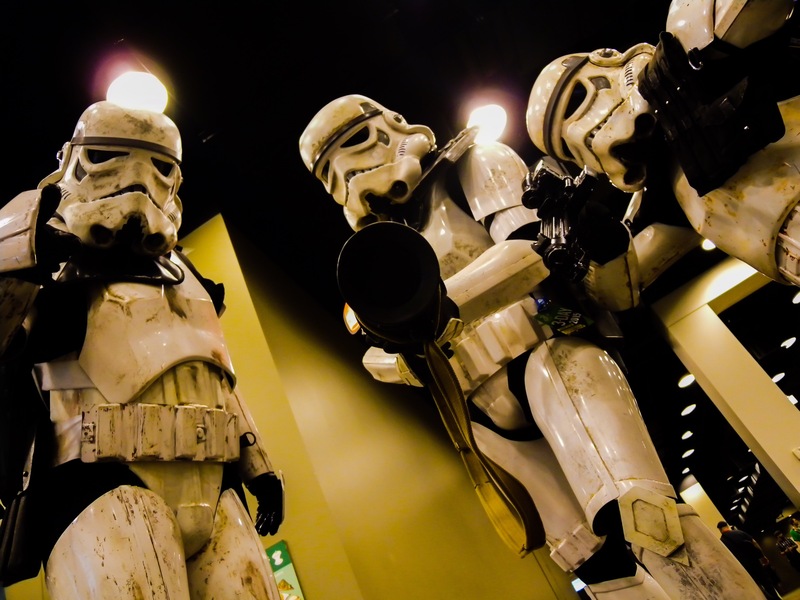 They let me go, after showing them the droids they were looking for. 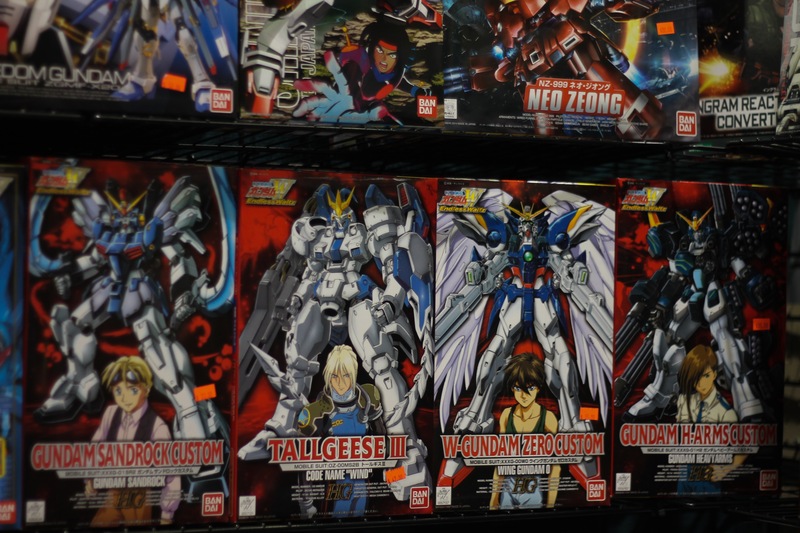 The Gundam Wing 1/100 Endless Waltz model kits. Not shown is my favorite, Duo Maxwell and his Deathscythe Hell Custom. 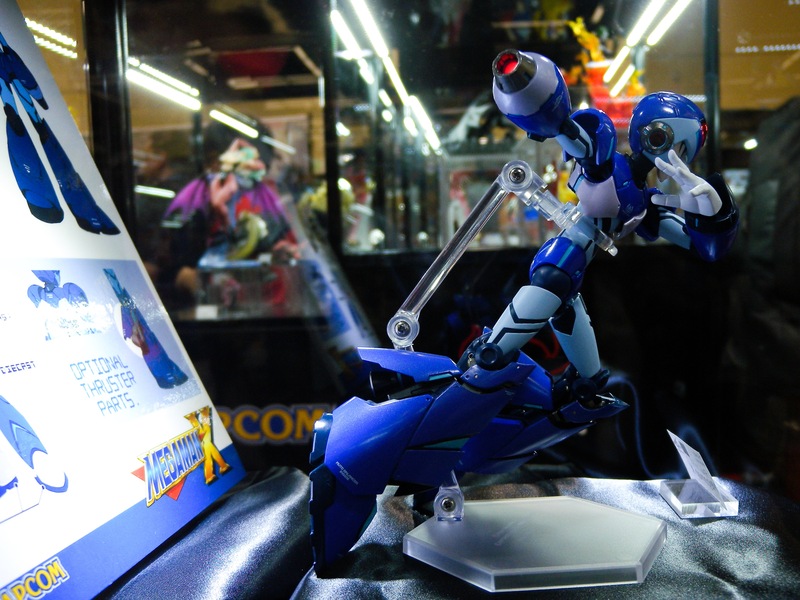 A new Mega Man figure coming from Bluefin toys. Multi-articulated with LED lights, and pop-out compartments. This was originally promoted as a Kickstarter campaign for fans, now with all goals met. 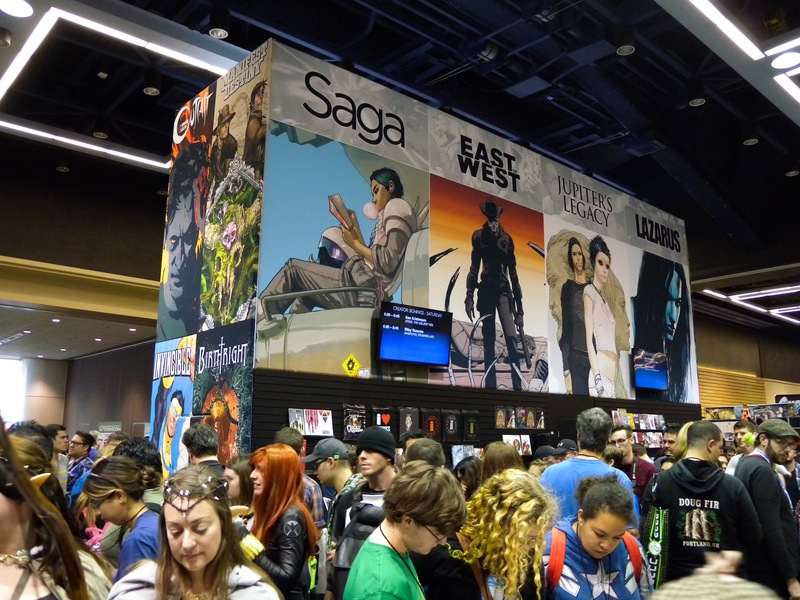 The Image Comics booth, once again standing tall as my favorite current comics publisher. 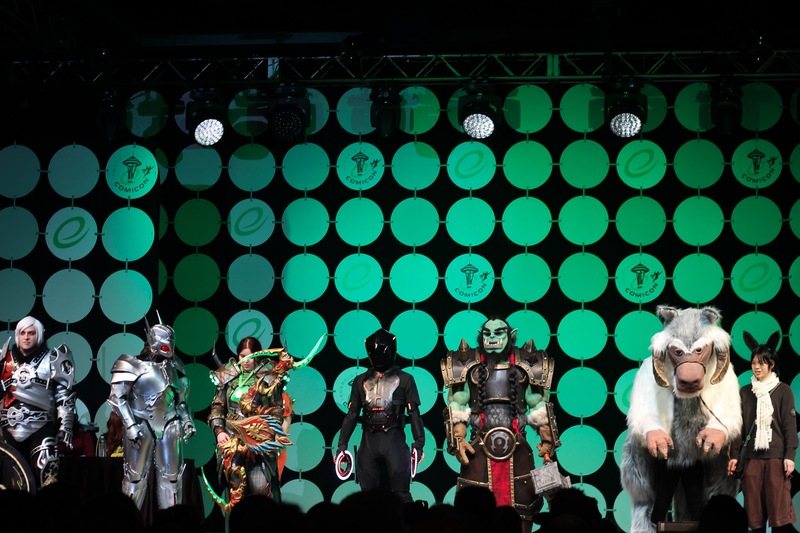 Some of the later stage cosplayers showcased that Saturday weekend night. There were many groups, with incredible detail and craftsmanship. The Troll from World of Warcraft (fifth from the left) I think won best in show. 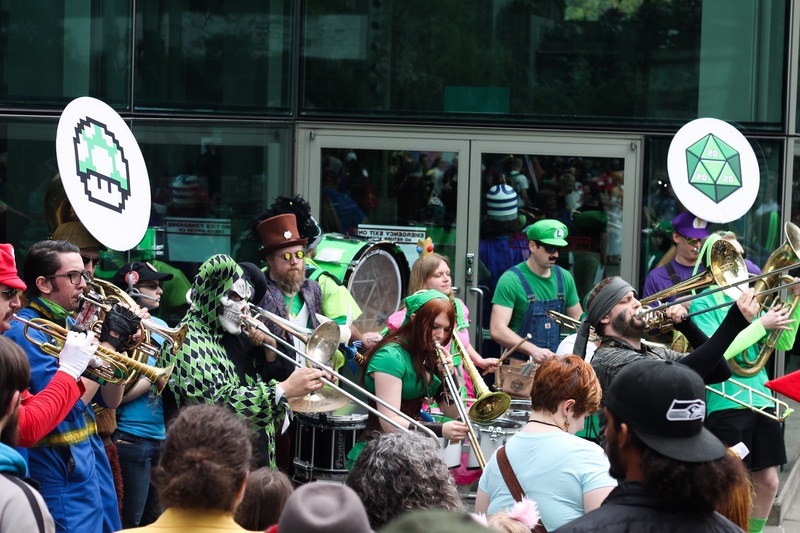 On the last day and outside the convention, lucky fans got an up close performance from the D20 Brass Band. Many cheered to the Legend of Zelda theme, and other classic tunes. Gotta love the some of the really geeky merch. 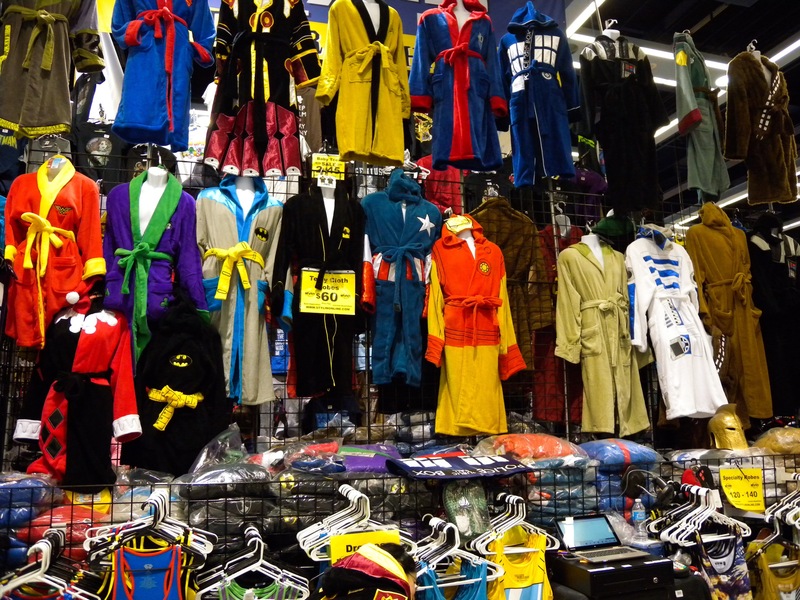 I was seriously considering buying that Chewbacca robe in the top right corner. 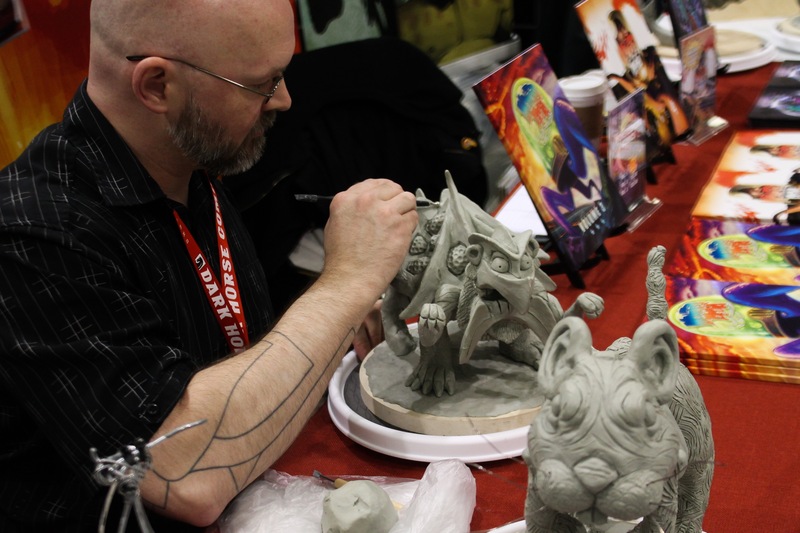 Rob McDaniel at work, sculpting with clay one of this amazing creatures. For the show, his work is inside the fantasy anthology series, Monsterpedia. 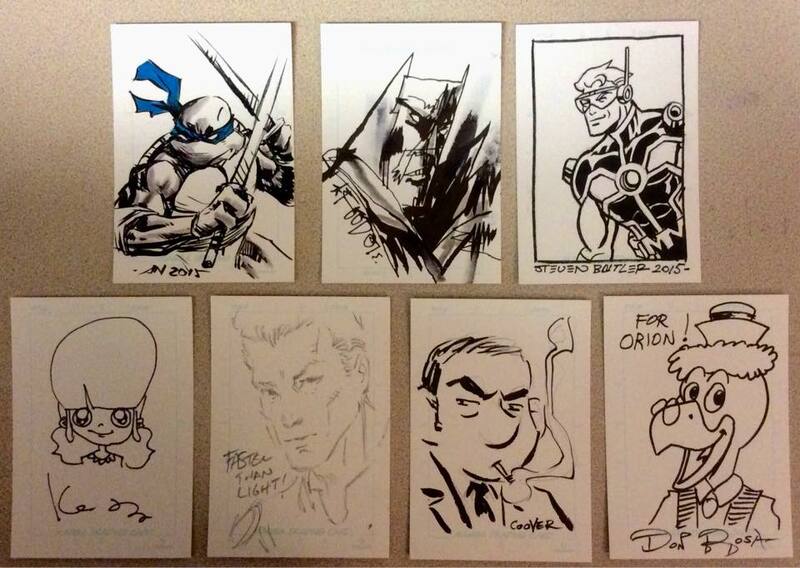 My obtained sketches on small trading card sized boards, from the show. From the top and left…Leonardo by Albert Nguyen, Batman by Jim Mahfood, Miniature Man by Steven Butler, random lady sketch by Enfu (local Seattle Artist), from the upcoming Faster Than Light augmented reality comics by Brian Haberlin (Anomaly) Inspector Belgique by Colleen Cloover (from Bandette), and Gyro Gearloose by Don Rosa! 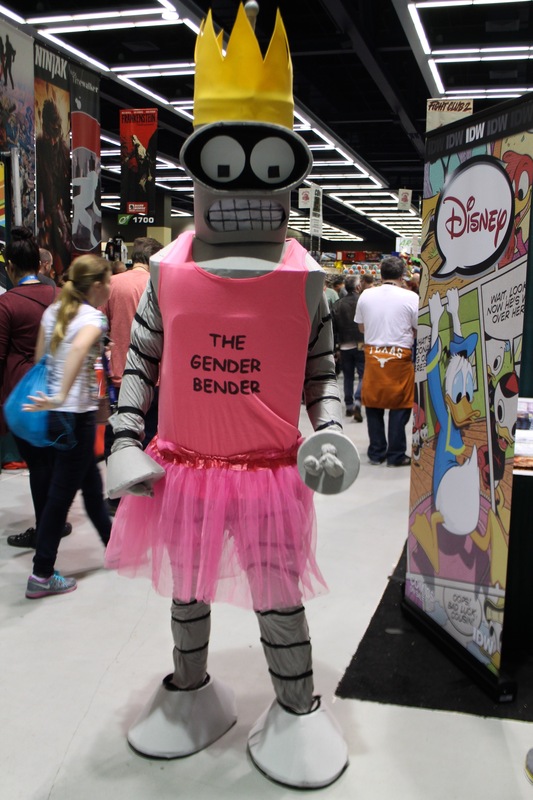 Well, that’s all for now, with Gender Bender taking us out. 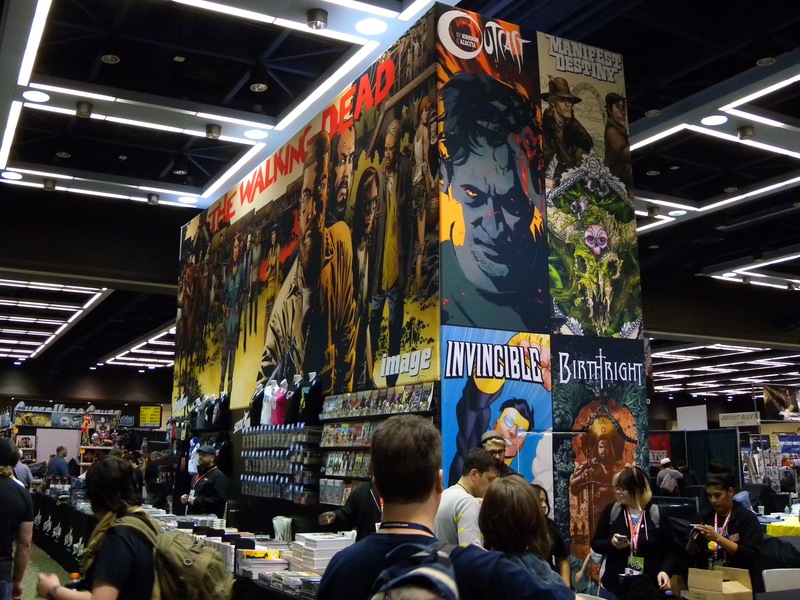 Until the next Con (probably San Diego in the summer)..
Posted on April 3, 2015 by Orion T.	This entry was posted in lifestyles, People, Photography, Saturdays and tagged 2015, art, comic books, comic con, comics, cosplay, ECCC, Emerald City Comic Con, geek, Seattle. Bookmark the permalink. ← Pictures of Today 4/1/15, Before the Storm..